What My First Kate Spade Bag Meant To Me Weekend Edition editor Barrie Hardymon remembers saving up for her first Kate Spade bag as a young New York music student. Yes, it held her Russian novels — but it also represented something more. 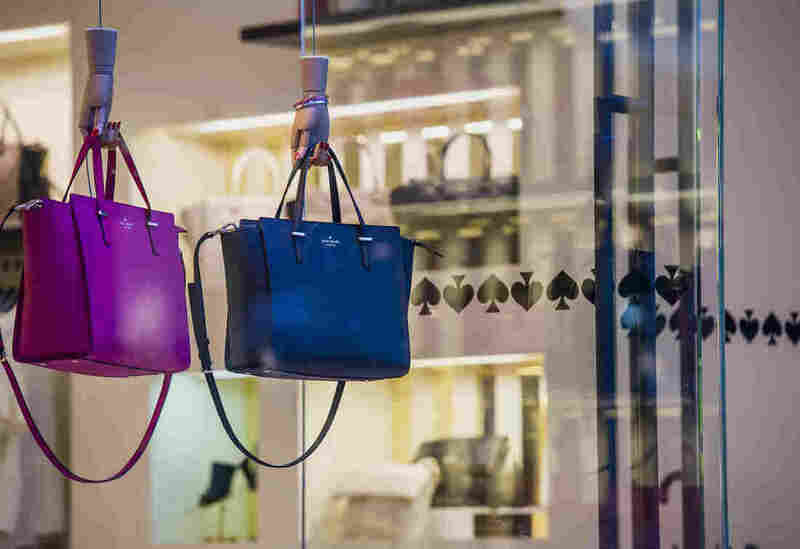 Handbags — which are not examples of the "Sam" mentioned below — hang on display in the window of a Kate Spade & Co. store in Corte Madera, California, U.S., on Friday, Feb. 27, 2015. I do not own a black nylon Kate Spade box bag. I own a knockoff: A black nylon Kate Spate box bag, purchased at an outdoor stand on Canal Street in the mid-'90s. But I have handled many examples of the real thing, and here are some facts that might not be instantly recognizable about that purse — the "Sam." 1. The straps are exactly the right length to slip over your shoulder, even if it is February in New York and you are wearing a thick, puffy coat. But they aren't so long that you can't carry it in the crook of your elbow if you are having an Audrey Hepburn moment. 3. Its default setting is, essentially, wide-open — you can see whatever's inside, whether you're an enterprising pickpocket or merely a curious onlooker. I arrived in New York City to attend a music conservatory in 1994, the year after the "Sam" was released — but alas, I carried only a Jansport backpack and black viola case. I dressed in all the markers of a suburban East Coast high school, but I knew that all those plaid shirts and roll-neck sweaters weren't truly me; after all, I read Judith Krantz and Carrie Fisher and Nora Ephron. In my mind, the wardrobe that best described me lay somewhere between Scruples and Surrender the Pink. And my god, I wanted that bag. I wanted it more than anything in the world. My eyes flickered past forearms on the subway, the street, uptown, downtown. I peered inside hundreds of Kate Spade bags and saw rolled-up newspapers and gold compacts and theater programs and stamped envelopes addressed to Con Edison. I should not have wanted that bag — I disdained the ubiquitous Coach wristlets and Prada backpacks I saw everywhere, because I did not want the things everyone else had — nor could I afford a purse that cost upwards of two hundred dollars. But the Kate Spade brand, and the designer herself, with her trademark up-do and ladylike shifts, exuded a cheeky sensibility that was essentially approachable: It was joyful chic. Those striped satin linings, the bright patterns, the shiny hardware — it was all so gay and lively. The fun part of Breakfast at Tiffany's, before they start looking for Cat in the rain. Today, when I heard the news of the designer's apparent suicide, I was struck by how personal it felt. It's because I felt like I knew Kate Brosnahan — a self-made gal, an optimist. Someone you could see inside, who, like her purses, was cheerful and classy, but possessed of an innate toughness and discipline. Kate Spade wasn't Coco Chanel. She seemed more like a pal — someone who knew that maybe you wanted your Russian novel to peek out of your bag, but you also wanted it to stay dry. Later, when I got my first job, I saved all my money, paid my rent and bought a fancy handbag (I'd long since stopped calling them purses) — a Kate Spade. I felt I owed it to her after my dalliance with that knockoff. The real thing was 40 percent off, and I've never seen another one, so it still feels like it was made for me — a brightly colored plaid messenger bag with an orange-red floral lining. It's gorgeous — and ridiculous. It says to me, Here, be fancy! Love objects if you must — but do it your way. And, above all, be fashionable — but still practical enough to carry all your books.